Dandy Dawgs uses only positive reinforcement training tools. I do not use prong or chain collars. Prong collars actually cause less trachea damage than choke chains but the dog does not learn to choose to make a decision based on anything other than discomfort. I do use soft British leads because, though a full choke, they stay in place well. 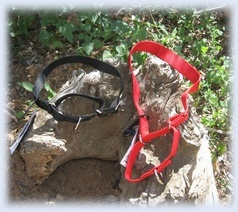 Limited choke martingale or combo collars are a fine training choice. Gentle Leaders and Easy Walk Harnesses help the dog choose to make the nice walking behavior we humans enjoy without strain or stress on the dog and are highly recommended when used and trained with properly. The tools included on this page are what I use myself in The Dandy Dawgs Programs. I encourage any of them to be used under the direction of a trainer and used properly! Gentle Leaders are a SUPER training option to help your dog’s pulling action by applying subtle pressure to the back of the head as the muzzle strap gently brings the dog’s head toward its handler. Where the dogs head is, so is his attention. It is often mistaken for a muzzle and absolutely is not. The dog can easily slip it off his ‘nose’, can drink water, eat and even bite is he so chooses! The dog often needs to be trained to enjoy wearing it. Usually pairing it with food is all it needs and it’s well worth the effort. Some dogs condition to it easily and others take a bit more time. Head collars are quite safe unless the handler uses a sharp jerk on the leash. This can cause neck injury to the dog. This is simply a training tool designed to encourage the dogs head to be with its handler. With proper training and focus exercises your dog can learn to walk delightedly next to your side. THESE SHOULD NOT BE LEFT ON A DOG AND USED ONLY FOR WALKING EXERCISES AND UNDER SUPERVISION! 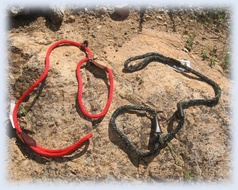 The Easy Walk No Pull Harness is unique in that the leash attaches to a ring at the chest with a martingale type attachment. It restricts movement as the dog pulls forward by drawing it to the side of the handler. Thus, drawing its attention to you! This is a Fantastic option to a standard harness where the leash attaches at the shoulder ring harnessing the strength of the dog. Those are designed for pulling carts and sleds! The Easy Walk Harness enables the handler to be better able to retrieve focus from the dog and help it to learn to walk at the handler’s side. On short coated dogs, it can cause chaffing and in some dogs can alter their gait. Like any training tool, it should NOT be left on the dog and only used for walking. It does not replace training the dog to focus on her handler to learn directions. They come in petite, small, medium, large and extra large in various colors depending on where purchased. 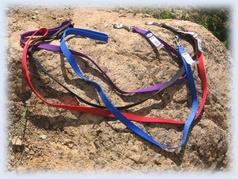 All Leashes and Leads are available in various colors depending on where purchased. Mendota British Style Slip Lead: 1/2 in. and 3/8 in. Omni Pet British Style Slip Lead: 1/2 in. I only suggest these with experienced handlers as they are a full choke lead, though softer than a chain. They do stay in place easily (at the base of the head) and are often used in sport activities when the dog needs to be released easily with no collar. Short Street Lead or Double Gripp Leash is a great street lead attached to a regular leash. 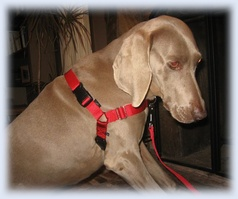 They allow a comfortable way to manage the leash at the side without wadding it up. I suggest avoiding the 1 inch width on these, ¾ is better. 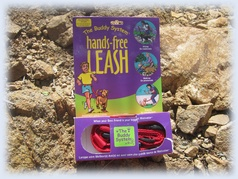 The Buddy System Waist Lead is a great training lead to help teach a dog to walk close to your side. I use them consistently and advise my students to as well. They are the only lead I recommend and allow in my Bike Dawgs Program. Light easy leashes and leads are the most common of tools and if used properly will enable your dog to walk nicely at your side. Coupled with a head collar or proper front attaching harness this process can be simplified greatly with little stress on handler or dog! Extension zip leads are not recommended unless training recall or for released exploring. Long 20, 30 or 50 foot lines are good tools for recall so long as your dog is ready for that level of freedom and will not jerk his neck when reaching the end. The Premier Collar is a martingale type collar that has a section on it where the leash attaches that will tighten when pulled. 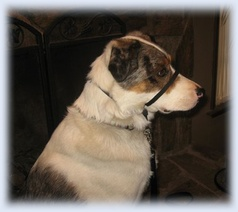 This is a limited choke collar and is often good for dogs whose necks are as big around as their heads. They are a training collar ONLY. I suggest the widest width to assure less choking and the ability to stay up close to the back of the head. The collar is loose and comfortable unless tightened and should be used carefully as with any training tool. I do not suggest any choke type collar for small dogs. Dandy Dawgs is all about positive reinforcement treat motivated training and quick access to treats is critical. Food motivated dogs are easy to train. There are other motivators as will but having access to treats quickly and smelling like yummy stuff is a sure way to help condition your dog to pay attention to you! 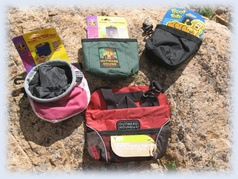 Quick access fanny type treat bags that wrap around your waist and totes are essential to good dog training. I have students who have easy aprons for training that work will too. The point is to be quick, a quick second from the time your dog gives you what you want to the time he receives a reward is the rule in early training!